They could not give it away no matter how hard they tried – and it was causing much head scratching in the Whitehall corridors of power back in 2011. The “It” in question was a government initiative to cut fuel bills by supplying loft insulation to those in need. However, despite being heavily subsidised,incentivised and advertised, the take up was minimal. So what do you do in these circumstances? Well if your the UK Government you can turn to the Behavioural insights team. The behavioural Insights Team was set up by David Cameron in 2010 and were tasked with improving public services. The team made up of, amongst others, psychologists, economists and researchers use the “nudge theory” which derives from behavioural economics to provide innovative solutions to identified problems. Viewed with some suspicion initially, the BIT, more commonly known as the Nudge Unit, are credited with an enviable range of successes including almost doubling the number of applicants to join the Army and encouraging an extra 100,000 people to sign up to become organ donors. The really impressive aspect of the whole enterprise is they do this not by grand plans but simply by small “nudges”. An example of the technique used was the sending of income tax liability reminders which just happened to mentioned that most of the recipients neighbours had already paid which is credited with helping to create revenue of £30 million, In respect of the loft insulation, the Nudge Units research showed that the issue was not the offer but apathy and laziness – clearing out lofts was too much of a chore. The introduction of a supported loft clearance service saw uptake rocket. So successful is the scheme that Nudge Units have been established in the USA,Germany and Australia. However the principles that underpin the unit are also being used in other ways. An example of its use outside of Government departments is the case of a major US retailer who suffered petty thefts from its warehouse that were beginning to become a financial burden. Rather than go down the route of expensive countermeasures like video surveillance etc. the company instead sought help from a psychologist. The result was letters personally signed by the CEO being sent to all members of staff which thanked them for their honesty. Thefts dropped to almost zero. The use of behaviour based techniques are also present in the police’s response to the ever present threat of terrorism. BASS (behavioural assessment system for security) had its origins in Israel and was exported to the USA post 9/11 where it was re-badged SPOT and is to this day used widely at Airports and other transport hubs. Whilst it has had its critics it is still part of the response to hostile reconnaissance both in the US and UK through the use of behavioural detection officers (BDOs). In fact the City of London Police responsible for the security of the majority of the iconic financial institutions have implemented project Servator which uses BDO’s as part of a strategic approach to security of the “square mile”. 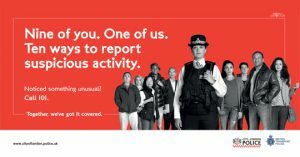 This approach is credited with an increase of positive stop and searches from around 10 to 60% and a decrease in complaints. 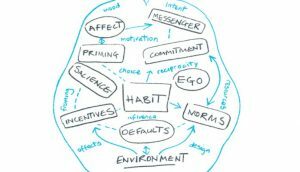 The role of behavioural science in our day to day lives cannot be under estimated and its influence are wide spread.